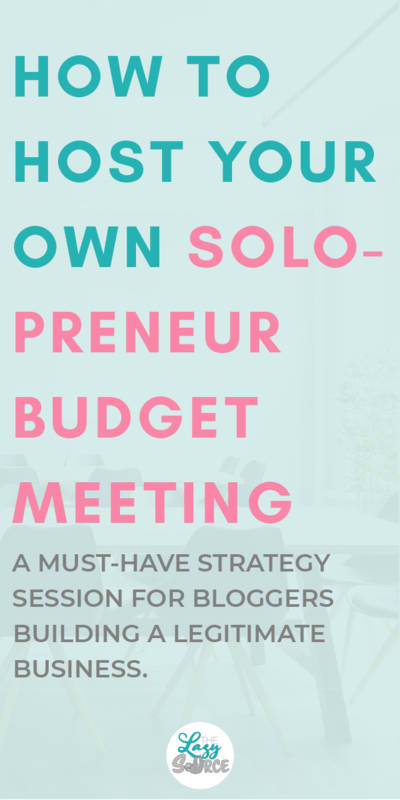 This is just a wild assumption, but I'm assuming your primary reason for reading this post is curiosity: "What the heck is a solopreneur budget meeting?" That would be exactly why I'm writing this blog post! How many of you are hosting full-scale budget meetings to analyze historical data and run future projections for your business....by yourself? Not many. Even I fail to be consistent at this sometimes. But if you've made it this far, let me make another wild assumption: You want your online business to be a real business. You want it to grow profitable and successful so it can provide for you and your family and free up your future. You want to do this right! And today, we're looking at one of the easiest ways to do that! Because a budget meeting isn't complicated, especially when you're running solo. What is a budget meeting? Step one, know what the heck a budget meeting is. Essentially, you're just sitting down to plan out what your money situation is going to look like for the upcoming future, whether you're planning monthly, quarterly, annually, or long-term. It's important to note that a budget meeting is not bookkeeping. It requires some bookkeeping to be done, but a budget meeting is a goal-setting and strategy session! Bookkeeping will inform the budget. Your budget meeting's purpose is to give you the opportunity to face hurdles before they become problems and embrace new directions before they're in your rear-view mirror. Before you sit down for a budget meeting, there are a couple things that need to be prepared. In a full-scale business, there's a date set on the calendar for the budget meeting, and everyone knows to do all their prep work prior to walking into that conference room. They know the goals going in, and they have all their reports and numbers drafted to support their plans and ideas. So, even though it's just you, that's what we're going to do! There's little point to assessing how you're doing if you don't know WHAT you're trying to do! Don't make this complicated. A lot of people stress out about financial goals because they're stuck trying to find a realistic number to attach to those goals. I get it, part of SMART goal-setting is to be Specific, but sometimes you have to work your way towards that with experience. If you're just starting, you simply don't know what numbers are right for your business. I want my business to cover our cost-of-living so we don't have to worry about paying the bills each month. I want my business to turn a profit within its first year. I want my business to generate large amounts of passive income so we can travel the world freely. I want to have one income stream to cover my business' costs so I can afford to offer my creative services at the best prices for my clients. I want my business to create a steady stream of supplemental income so my spouse can stop working overtime. See how these are all completely different levels and directions for financial goals? Some are big, ambitious, empire-building goals. Others are simpler, quieter goals that are just meant to bring some peace and comfort. Please note that ALL of these are admirable goals. Identify your goals, because the direction you want to take your business will affect your future decisions. Now that we've got your goals for the future, we need your records from the past! This is where your bookkeeping system comes into play; we want to know how your business has been performing. RELATED POST: Bookkeeping 101: How to Start TODAY! If you do manage a bookkeeping system, you'll want to have reconciled your bank account and finalized your Profit & Loss statement for the previous month, quarter, year, or whatever time period you choose to work with. It's your budget meeting after all! Alright! Now it's time for the official budget meeting. So collect your documents and all the fancy office supplies that make you feel powerful and sit at a table. It can be your desk or it can be your dining room table, but sit at a table that makes you feel like you're in a conference room. - Assess and analyze your numbers. First up, we've got to take a look at what's happened so far. Enter, your income statement! Did your income cover your expenses, or did you end up with a loss last month? How does this compare to the month before it? Do you see any notable trends with your income or certain expenses categories? Why do you think those trends are appearing? Is a certain expense taking up a large portion of your revenue? Are there any expenses to be cut, or do you need to focus on increasing your income? Jot down some of the thoughts, observations, and questions that come to mind as you look at each line of your statement. If you have to, go back into your bank statements or bookkeeping software to remind yourself of why certain numbers are the way they are (this is when it comes in handy to use those notes/memo fields when inputting transactions into your bookkeeping software!). If you had a budget (which I highly recommend! ), how did your performance match up against your goals? If you did better, why? Can you capitalize on that? If you did worse, why? How can you improve? What needs to be cut? Let's take care of the ugly stuff now. During your analysis, if you found any potential issues, we should create a plan to tackle those issues. Has your income been decreasing for the last few months? Do you seem to be overspending on courses and ebooks? Is a large portion of your regular expenses going towards client projects that don't cover those expenses? Time to make a plan! Is it time to run a new promotional launch for your digital products to bump your income back up? Do you need to put yourself on a course spending-freeze and focus on completing the ones you've already bought? Do you need to reevaluate the resources you use to complete client work or raise your prices? Now's the time to address these questions and start brainstorming a way out. Facing issues puts out fires, but setting goals will move your business forward. If you've started developing some plans in the previous step, you're already working towards this. It's time to start using what you've learned about your business so far to reevaluate your goals. Maybe you're informed enough to start making them more specific! Or maybe you're realizing that the timeline you set was completely unrealistic. Maybe you've uncovered a new goal you didn't even know you wanted at first! Now's the fun part where you get to start dreaming again. You're done with the number crunching (for now), so start thinking big and making those plans! - Identify upcoming opportunities and threats. As you work on developing your plans, be mindful of potential opportunities and threats to your business. This is an aspect of what's called a SWOT Analysis - strengths, weaknesses, opportunities, and threats. It's an analysis tool to help you find the best and worst of your business internally (strengths and weaknesses), and the best and worst of your business externally (industry opportunities and threats). Do you plan on having any upcoming launches? Is a slow season approaching? Any industry activity that may affect your audience and your brand? For example, I view the launch window for The Genius Blogger's Toolkit as a threat to my email marketing and any launches I'd like to run. My audience will be receiving dozens of emails about this promotion, and they'll be fed up with both emails AND sales pitches! - Adjust your budget (or create one if you haven't yet). Using what you know from your historical data, what you planned for when assessing the problems, and what you dreamed for when setting new goals, set some new projections for your income and expenses in the upcoming month. Assign your current bank balance (which means get a separate checking account today for your blog!) to your upcoming expenses, and set some income goals to get that balance back up to where you want it! How to make this meeting happen. Try to do it anyway. Set it on the calendar, on any day of the first week of the month so you can review the old month and still have time to make changes moving forward. Honestly, you'll barely need 30 minutes if you keep yourself organized. Don't feel weird about it, you're a business! If you had a team in a real office, you'd want to be sitting down with them regularly to make sure everyone is on the same page, no? Well, believe it or not, your mind is all over the place (especially when you're a creative), so you've got to sit down and get yourself on track! You're wearing all the hats, and you need to get all those hats together every now and then and make sure they're all on the same page. You can always get a business finance coach to host your meeting with you. Surprise, that's me! I'll be completely honest, when I first outlined and drafted this post, I didn't even think to include this little pitch, so don't get salty. I'm literally adding it because it can genuinely help you. But hey, I offer 60-minute Clarity Calls that are centered on your blog's financial health and profit goals. Essentially, we'll be having one big (and totally effective) budget meeting! And, if you ask me, the price ain't half bad, either. It's time to take your business seriously and run it like a business. A real business involves numbers and strategies, so you've got to face those as well if you want your business to grow. And a regular Budget Meeting is honestly a super simple and super powerful way to do that. Have you ever hosted a budget meeting with yourself for your business? Will you start hosting them now? Let me know in the comments below!